Low-cost electrical energy storage will transform renewable energy sources from a bit player to a mainstream role in our energy economy. It is required for the use of electricity generated from intermittent, renewable sources such as solar and wind. In 2010, Texas wholesale power prices went negative 17% of the time due to too much wind and not enough storage. Sometimes, generators operating nuclear, gas, or other plants actually pay other generators to shut down, since ultimately that’s cheaper than ramping down their own plants. Large-scale energy storage is one of the Federal focus areas for the Smart Grid. Electric energy storage can increase the value of electricity by enabling it to be used whenever and wherever needed. While the grid has historically consisted of power generators and power users, now we are beginning to see devices that are both generators and users -- for example, energy storage and plug in electric vehicle. Improved electrical energy storage is needed for the national electrical grid to relieve current stresses on the grid and to cope with the growth of intermittent renewable energy sources. Mechanical energy storage technologies such as pumping water uphill and compressed air storage are feasible with current technology, but these can’t be used everywhere. Electrochemical energy storage using batteries offers higher stored energy per volume and easier deployment, but is today much more costly. Even so, large batteries are already being deployed to help control frequency fluctuations on the grid, because they can provide lots of power for a short period. AB2514 - California Assembly Bill 2514, as originally written by state Rep. Nancy Skinner and would have required that the state’s utilities match 2.25 percent of their peak loads with energy storage by 2014, and 5 percent by 2020 — a goal that could have equated to about 3,400 MW of storage capacity in the next 10 years. When signed into law by Governor Schwarzenegger in September 2010, the law requires the California Public Utility Commission (CPUC), by March 1, 2012, to open a proceeding to determine appropriate targets, if any, for each load-serving entity to procure viable and cost-effective energy storage systems and, by October 1, 2013, to adopt an energy storage system procurement target, if determined to be appropriate, to be achieved by each load-serving entity by December 31, 2015, and a second target to be achieved by December 31, 2020. Ancillary Services - Balancing services used to balance generation and demand in tightly limited situations to maintain the alternating current (AC)system frequency of 60 Hz. EES is perfectly suited to provide this service by absorbing electric energy (charging cycle) whenever there is too much generation for a given demand and by injecting electric energy into the power grid discharging cycle) when there is too little generation. Traditionally, these services have been performed by conventional gas or steam turbine technologies. But rather than varying the torque of large rotary turbo-machinery on a second-by-second basis, electrochemical EES is much better suited to quickly respond to the grid needs. Battery Storage - Utilities typically use batteries to provide an uninterruptible supply of electricity to power substation switchgear and to start backup power systems. However, there is an interest to go beyond these applications by performing load leveling and peak shaving with battery systems that can store and dispatch power over a period of many hours. Batteries also increase power quality and reliability for residential, commercial, and industrial customers by providing backup and ride-through during power outages. CAES - See my blog article Compressed Air Energy Storage - Uses pressurized air as the energy storage medium. An electric motor-driven compressor is used to pressurize the storage reservoir using off-peak energy and air is released from the reservoir through a turbine during on-peak hours to produce energy. Ideal locations for large compressed air energy storage reservoirs are aquifers, conventional mines in hard rock, and hydraulically mined salt caverns. Air can be stored in pressurized tanks for small systems. Curtailment - A reduction in the output of a generator from what it could otherwise produce given available resources, typically on an involuntary basis. Curtailment of generation has been a normal occurrence since the beginning of the electric power industry. However, owners of wind and solar generation, which have no fuel costs, are concerned about the impacts of curtailment on project economics. Operator-induced curtailment typically occurs because of transmission congestion or lack of transmission access, but it can occur for a variety of other reasons, such as excess generation during low load periods, voltage, or interconnection issues. EDLC - Electrochemical Double Layer Capacitors - (Also known as supercapacitor, supercondenser, pseudocapacitor, or ultracapacitor) Store energy directly as charge. An EDLC is an electrochemical capacitor with relatively high energy density. Compared to conventional electrolytic capacitors the energy density is typically on the order of hundreds of times greater. 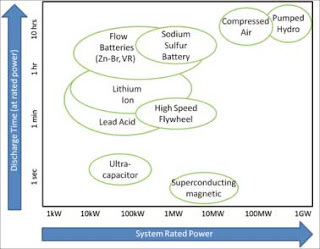 In comparison with conventional batteries or fuel cells, EDLCs also have a much higher power density. ESS - Energy Storage System - Devices or physical media that store some form of energy to perform some useful operation at a later time. A device that stores energy is sometimes called an accumulator. DER - Distributed Energy Resources - Small-scale energy generation/storage sources capable of providing temporary changes in electricity supply. Expands on Distributed Generation (DG) to include technologies such as battery energy storage, and superconducting magnetic energy storage. 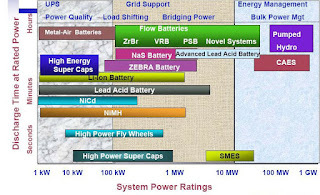 Flow Batteries - (See my blog Article: Battery Storage) Flow batteries differ from conventional rechargeable batteries in one significant way: the power and energy ratings of a flow battery are independent of each other. This is made possible by the separation of the electrolyte and the battery stack (or fuel cell stack). A flow battery, on the other hand, stores and releases energy by means of a reversible electrochemical reaction between two electrolyte solutions. There are four leading flow battery technologies: Polysulfide Bromide (PSB), Vanadium Redox (VRB), Zinc Bromine (ZnBr), and Hydrogen Bromine (H-Br). Flywheel - (See my Blog Article: Flywheel) An electromechanical device that couples a motor generator with a rotating mass to store energy for short durations. NASE - Network Attached Storage for Energy - Right now, many companies are talking mostly about planting energy storage facilities where power like solar or wind is generated. But why not put energy storage where it gets consumed, sort of the way Akamai figured out how to cache network data closer to consumers. SMES - (See my blog article Superconducting Magnetic Energy Storage) - Energy is stored in the field of a large magnetic coil with direct current flowing. It can be converted back to AC electric current as needed. Low temperature SMES cooled by liquid helium is commercially available. High temperature SMES cooled by liquid nitrogen is still in the development stage and may become a viable commercial energy storage source in the future. SMES systems are large and generally used for short durations, such as utility switching events. Supercapacitors (also known as Ultra-capacitors) are DC energy sources and must be interfaced to the electric grid with a static power conditioner, providing 60-Hz output. A supercapacitor provides power during short duration interruptions and voltage sags. By combining a supercapacitor with a battery-based uninterruptible power supply system, the life of the batteries can be extended. The batteries provide power only during the longer interruptions, reducing the cycling duty on the battery. Small supercapacitors are commercially available to extend battery life in electronic equipment, but large supercapacitors are still in development, but may soon become a viable component of the energy storage field. A Smart Grid is a key enabler for energy storage with the goal of peak reduction. Recently, advancements with emerging storage technologies, particularly in battery, flywheel and above ground compressed air energy storage provide the potential of making Storage a ubiquitous Smart Grid Tool. There have been advances in fast response, multiple cycles, transportability The technologies all perform differently but can excel is specific applications. Distributed energy storage will find applications on both the utility and customer sides of the meter. Utilities are using storage to defer equipment upgrades and to reduce loads at congestion points. Customers use energy storage to improve power quality, reduce demand charges and to participate in demand response programs with minimal impact on their operations. Communities, campuses and bases can use storage as critical elements of micro-grids and energy management systems. Both customers and utilities can use energy storage in conjunction with photovoltaic (PV) systems to smooth output and time-transfer energy generated at times of low value to times of high value. Community PV/Storage systems are being considered for green residential, light commercial and micro-grid projects. Integrate Intermittent Renewable Generation - As wind power deployment increases, wind output may begin to exceed electricity demand during certain times of the year, which would necessitate curtailment unless energy storage options are available. The July 2008 DOE report 20% Wind Energy by 2030: Increasing Wind Energy’s Contribution to U.S. Electricity Supply discusses the scenario in which integration of 300 GW of wind energy into the U.S. grid is achieved To deal with the variability of the wind energy output, approximately 50 GW of new peaking plant gas turbines would be used to supplement or compensate for the variability of the wind power’s output. Energy storage could serve a portion of this needed capacity. Defer Transmission Upgrades - Energy storage may be able to reduce the transmission capacity needed for renewables by up to two-thirds. Many large-scale renewable energy facilities for solar and wind farms are located in remote areas that require new transmission lines to access them. However, energy storage could reduce the cost of these lines by decreasing the capacity of transmission needed to transmit the electricity. Without storage, the transmission lines to these remote sites would be built to accommodate the maximum amount of wind or solar energy produced, or else the facilities would have to dump any excess energy that the line cannot accommodate. According to the Electricity Advisory Committee, for some wind projects, it is currently more cost-effective either to build transmission capacity for less than the full energy maximum of the project or dump surplus energy during the hours when output exceeds transmission capacity. Supports Micro-grid Operations - Balances microgrids to achieve a good match between generation and load. Improves Reliability - interruption protection, voltage support and power quality. Electric energy storage increases the tolerance of sensitive electrical equipment and end-use devices to withstand the frequent power quality variations in the electrical environment. Achieve a more reliable power supply for high tech industrial facilities. Ancillary Services - Fast response capabilities allow devices to perform better than current devices (Increased need for regulation) A significant issue for regulation is that traditional fossil generation plants are required causing the renewable integration needs from increasing emissions Reduce damages from greenhouse gas emissions due to generation from clean energy generation substituting for power from less clean sources. DER Interoperability Standards Immature - Currently, commercial storage technology is not realistically capable of supporting the full Smart Grid dispatchable storage vision, which makes it difficult to predict what information needs will be required. DER communications are covered by the IEC 61850 series. At present, it is anticipated that DER standards will support the basic information required for communication with storage devices. 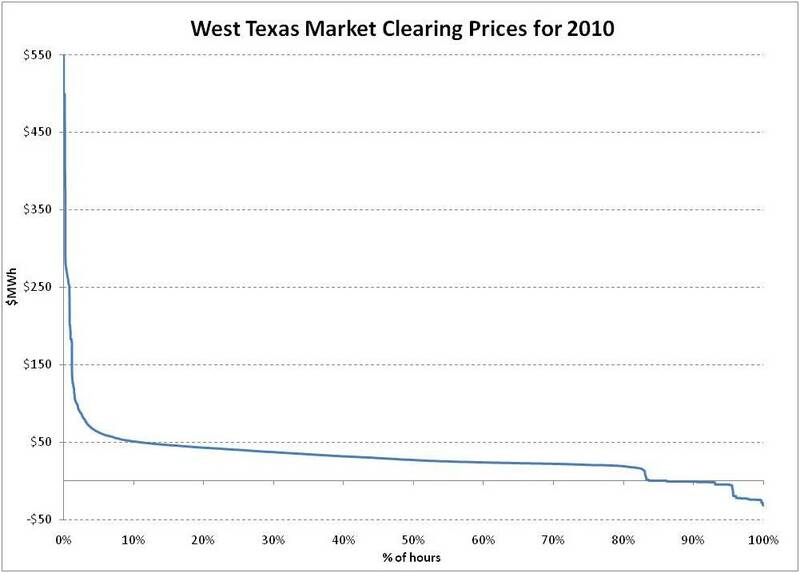 Rate Schedules Needed - There needs to be a rate schedule that makes thermal energy storage economically feasible. We need a rate schedule for the whole state, perhaps for the whole nation, which guarantees the difference of on-peak and off-peak energy costs or demand costs, to insure and guarantee for the next, ten years, so that investors and builders and people that want to build central plants can invest and know this is the predictions we can have. Thermal energy storage is the most neglected demand-shifting optional device we've had. Smart Grid Integration - Identifying the control technologies and algorithms necessary to ensure storage can seamlessly work with Wind, Solar, and Grid requirements when integrating renewables to the electricity grid. California ESS Procurement Targets - AB 2514 requires the CPUC, by March 1, 2012, to open a proceeding to determine appropriate targets, if any, for each load-serving entity to procure viable and cost-effective energy storage systems. Under the terms of AB 2514, by October 1, 2013 the CPUC shall adopt an energy storage system procurement target, if determined to be appropriate, to be achieved by each load-serving entity by December 31, 2015, and a second target to be achieved by December 31, 2020. In addition, the CPUC should consider a variety of possible policies to encourage the cost-effective deployment of energy storage systems, including refinement of existing procurement methods to properly value energy storage systems. Power-oriented (fast) Energy Storage will grow quickly in the near to mid term but will be constrained in the long term by a modest total market size. Power-oriented (fast) energy storage is poised for strong near- to mid-term growth. Its most significant component, the frequency regulation market, has recently been opened up for direct entry by energy storage in some ISO regions of the U.S. with additional ISOs anticipated. This means that energy storage can secure contracts for grid frequency regulation on the open market and the owner of the system will get compensated in cash. This obtainable, all cash benefit stream makes obtaining compensation for an energy storage system much less complicated than many other implementations. New highly robust, moderate cost lithium-ion batteries are able to provide this service cost effectively and are beginning to be deployed successfully in a few regions of the U.S. and in Chile. This trend is expected to continue and accelerate with the addition of new renewable resources on the grid and further decreases in the cost of lithium-ion batteries. Energy-Oriented (load shifting) energy storage has a massive total market size, however it is only beginning to be ready to be exploited. Energy-oriented (load shifting) energy storage offers a number of potentially lucrative opportunities for implementations that strategically combine applications. While wholesale load shifting is sometimes discussed, it does not create enough value to be cost effective on its own in most situations right now. There are many existing strategic load shifting implementations that are or are close to becoming cost effective. The challenge with these implementations is that some of the benefits are generated as non-cash benefits which can be difficult to monetize. Additionally, the benefits come from bundling different value streams, which are feasible technically but challenging to accrue to one entity for regulatory reasons. In some parts of the world, like Japan, where the value created from single applications is higher or utilities are more easily able to accrue value from the multiple benefits generated, sodium sulfur (NaS) load shifting energy storage has already gained a good foothold and has recently gained favor in other countries like France and the UAE, though only small pilot installations exist in the U.S. New flow battery technology, particularly zinc-bromide, has recently become more cost effective than NaS for many implementations and is expected to grow to surpass NaS installations by 2015. Advanced lead acid batteries are also expected to show impressive growth due to further cost reduction. 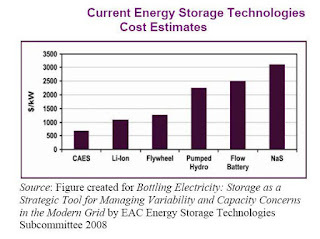 Create an energy storage asset class - A separate asset class could provide more certainty that energy storage costs can be reimbursed and provide more certainty in that respect, and I think if FERC were to take the lead on that, that that would have a trickledown effect for State policies. Unbundled Ancillary Services - ISO's should unbundle ancillary services, to provide energy storage technologies and manufacturers and developers to have an in, to be able to bid on some of these ancillary services. Modeling and analysis to determine how much storage is required to support state and national renewable goals. Determining appropriate regulatory, market, and incentive treatments to encourage storage in support of renewables. Identifying the control technologies and algorithms necessary to ensure storage can seamlessly work with Wind. Determining how to allocate costs and benefits for cost recovery when storage is used in a multi-purpose application. CESA - California Energy Storage Alliance - The alliance includes battery makers such as EnerVault, A123Systems, Deeya Energy, Prudent Energy, Xtreme Power, ZBB, Powergetics and AltairNano, as well as flywheel maker Beacon Power, air conditioner energy storage maker Ice Energy, solar panel giant Suntech and oil, gas and energy services giant Chevron. That list is representative of the range of technologies that could play a role in helping California meet such a challenging goal. Green Charge Networks - Santa Clara, CA - Founded in 2009, focuses on helping businesses and institutions reduce peak demand charges through a combination of predictive software and battery hardware the company calls "power efficiency." Green Charge Networks claims to be the first company to offer Power Efficiency Leases. Similar to the way that solar leases helped solar become mainstream by allowing more homeowners to go solar with zero money down, GCN aims to help more businesses utilize energy storage by offering them Greenstations at zero upfront cost. The idea of power efficiency builds off the difference between energy (kWh) and power (kW). Energy efficiency focuses on reducing the amount of energy consumed while power efficiency focuses on reducing the rate at which energy is used, also known as peak demand. Commercial and Industrial electric tariffs include costs for peak demand known as Demand Charges. Green Charge operates under a shared savings model with customers. The company owns systems at customer facilities and covers the capital expenses for installation and interconnection, as well as provides ongoing operations and maintenance services. California Energy Storage Roadmap - The California Energy Commission (CEC), the California Independent System Operator (CAISO), and the California Public Utilities Commission (CPUC), developed an energy storage roadmap that identifies policy, technology and process changes to address challenges faced by the energy storage sector. The comprehensive roadmap assesses the current market environment and regulatory policies for connecting new energy storage technology to the state’s power grid. It is the result of collaboration by the three organizations and input from more than 400 stakeholders, including utilities, technology companies, environmental groups, and interested parties. CPUC Proceeding on Electric Energy Storage. - On April 2, 2015, the California Public Utilities (CPUC or Commission) opened an Order Instituting Rulemaking (OIR) in response to the enactment and ongoing implementation of legislation Assembly Bill 2514 and to continue to refine policies and program details, which established the Energy Storage Procurement Framework and Program and approved the utilities' applications in implementing the program. This rulemaking considers recommendations included in the California Energy Storage Roadmap, an interagency guidance document which was jointly developed by the California Independent System Operator, the California Energy Commission and the CPUC.